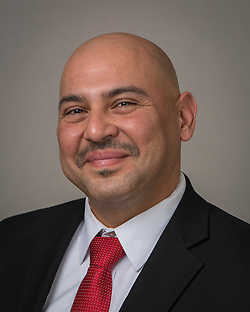 Luis Landa has been selected as the new principal of Sutton Elementary School. Most recently, he served as assistant principal at Austin High School and teacher specialist at Patrick Henry Middle School. Landa taught at McReynolds Middle School, where he was a lead teacher, department chair, and teacher of the year. For the last two years, he has served on the Bill and Melinda Gates Foundation Teacher Advisory Council, where he provided support on national education initiatives. Landa earned a B.S. in biology from the University of Texas at San Antonio and a M.Ed. in curriculum and instruction from the University of St. Thomas. He is in the process of completing his Ed.D. in educational leadership from the University of Houston. This entry was posted in Staff updates and tagged Sutton ES on January 31, 2017 by HISD Communications. Sutton Elementary School students performed classic and original holiday songs at its annual winter concert for parents and the community. Students performed songs from the movie, Frozen, and sang songs from a musical written by their music teacher, Dwain Dancy. The concert was held at the school on Dec. 8 and at Clarewood Nursing Home on Dec. 15. The students also delivered personalized holiday cards that they made for the elderly at the nursing home. This entry was posted in District V - Sue Deigaard, Elementary Schools and tagged Sutton ES on December 19, 2014 by HISD Communications. This entry was posted in District II - Rhonda Skillern Jones, District V - Sue Deigaard, Elementary Schools and tagged McGowen ES, Sutton ES on November 18, 2014 by HISD Communications. Volunteers in HISD’s Read Houston Read initiative have met the students they’ll be working with this school year and are beginning the journey of helping children develop a love for reading. This entry was posted in District V - Sue Deigaard, Elementary Schools, Literacy and tagged Read Houston Read, Sutton ES on November 5, 2014 by HISD Communications. 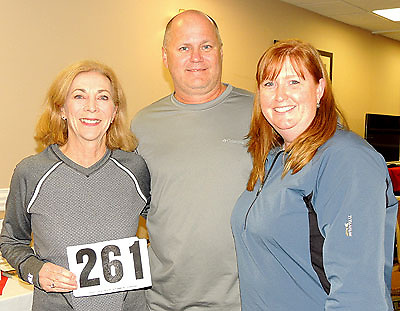 Endurance runners and HISD employees Alyssa Howell (right) and her husband, John Smith, pose with Kathrine Switzer, the first woman to officially run the Boston Marathon, at a pre-race dinner in Syracuse, New York, on Oct. 18. Switzer is holding the bib number she wore during the 1967 Boston Marathon, in which she broke the previously all-male tradition. Ever wonder what it’s like to meet one of your personal heroes? If so, just ask HISD Teacher Development Specialist Alyssa Howell or her husband, John Smith, who teaches at Sutton Elementary School. This entry was posted in District V - Sue Deigaard, Elementary Schools and tagged Sutton ES on October 31, 2014 by HISD Communications. 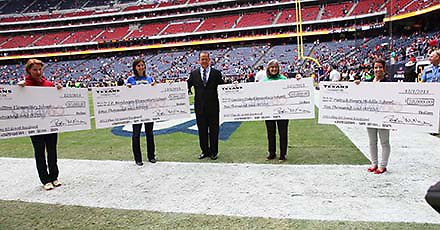 Houston Texans President Jamey Rootes congratulated HISD personnel for their winning NFL Play 60 grants. Left to right, they are Ines Brost, Sutton ES; Lisa McManus, J.P Henderson ES; Lindsey Pollock, Garden Oaks ES; and Sarah Stafford, Patrick Henry MS.
Four HISD schools have scored big with the Houston Texans, winning NFL Play 60 grants from the team to supply campuses with playground or gym equipment that broadens physical education and afterschool programs. This entry was posted in Elementary Schools, Middle Schools and tagged Garden Oaks ES, Houston Texans, JP Henderson ES, NFL, NFL Play 60, Patrick Henry ES, Sutton ES on December 12, 2013 by HISD Communications.